Thirsty Bois: Wet n' Wild is a 2D Shoot em' Up with a Futuristic Wild West setting where you play as a couple of thirsty Robot Cowboys looking to not die by overheating. 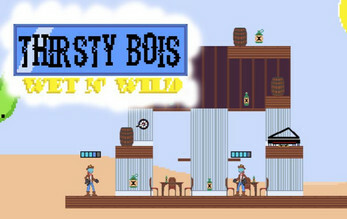 Pick up bottles of water to keep yourself cool and shoot your enemy to keep them from stealing your precious resources. But be careful, shooting takes water! Note: You do have to download both files to play. Download the EXE and PCK file and enjoy!